It’s not enough, apparently, to have a successful video game console; there’s a long history of the industry trying to sweeten the appeal of the purchase by promoting or promising additional non-gaming features. Sony wanted you to run Linux on your PS3, Microsoft wanted your Xbox One to be a cable box and DVR, Nintendo wanted your Gamecube to serve as a connection hub for four handheld consoles (sold separately), NEC wanted your TurboExpress to be a handheld TV Tuner, and the list goes on and on. It’s not that it’s necessarily a bad thing to do this, it’s just… when has this ever been a good thing? Sometimes it’s the idea that’s awful, sometimes the world’s just not ready for the promise, and sometimes you’re just not ready to deliver on the promise. That last one seems to have been the case with the Coleco Adam, 1983’s literal and figurative expansion on the Colecovision system. 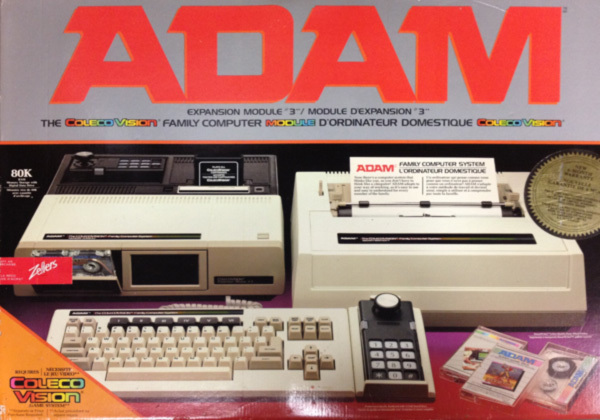 The promise of the Adam was significant: an all-in-one home computer system, with printer, for $600. It would be available as a standalone unit or as an add-on to the Colecovision system, fulfilling an earlier promise made with the announcement of the game console. It was an intriguing offer until it started to fall apart. Over the course of development the price rose to $725, development of the printer and other technical issues repeatedly pushed back the launch window, and once the Adam did release it had an astonishingly high return rate due to defects. It was essentially dead on arrival. That doesn’t mean it was a bad idea – Commodore and Atari both tried the same all-in-one approach after Coleco announced the Adam – it’s just that it never really worked out. 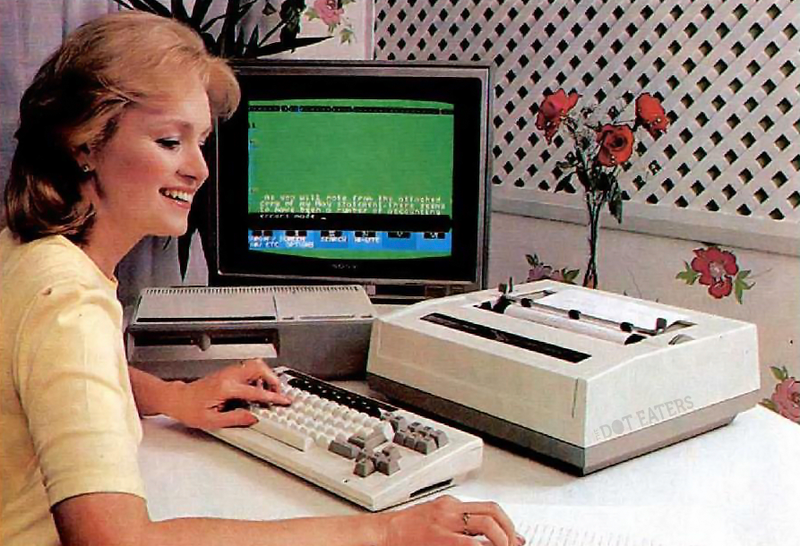 Coleco continued to market it, though. There’s a lot of great advertising for this mess and that’s what I wanted to take a look at today. This first one features Lori Laughlin from Full House, questioning the legality of cut and paste. This one is positioned at the (understandably) clueless parents who just want to throw money at tools designed to help children be smarter. Another one in the same ballpark, leveraging a father’s insecurity about his son’s intelligence compared to the other children. Feed money to that insecurity! The approach shifts slightly to the competition here, showcasing the value you get with the Adam compared to Atari’s offering. Sorry, Atari! All of the spots up to this point have been oddly aggressive. This next commercial is refreshing in the way it simply celebrates the features of the Adam. I can’t imagine this spot worked well, though; things were dire for the Adam and aggression seemed necessary. 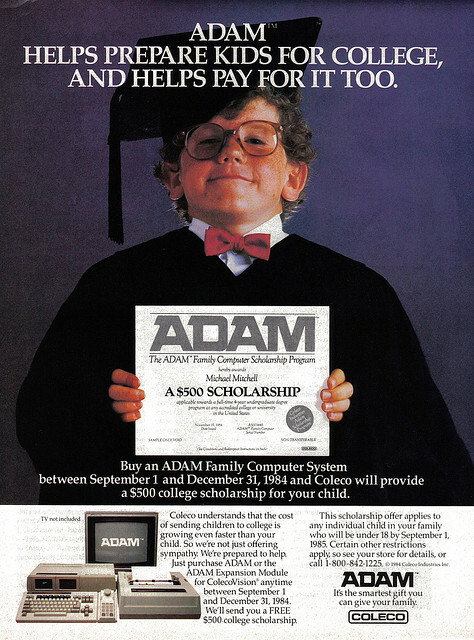 Coleco leaned hard into the ‘parental insecurity’ thing and actually offered a scholarship to anyone purchasing an Adam in the fall of 1984. Here’s an accompanying print ad for the scholarship program. 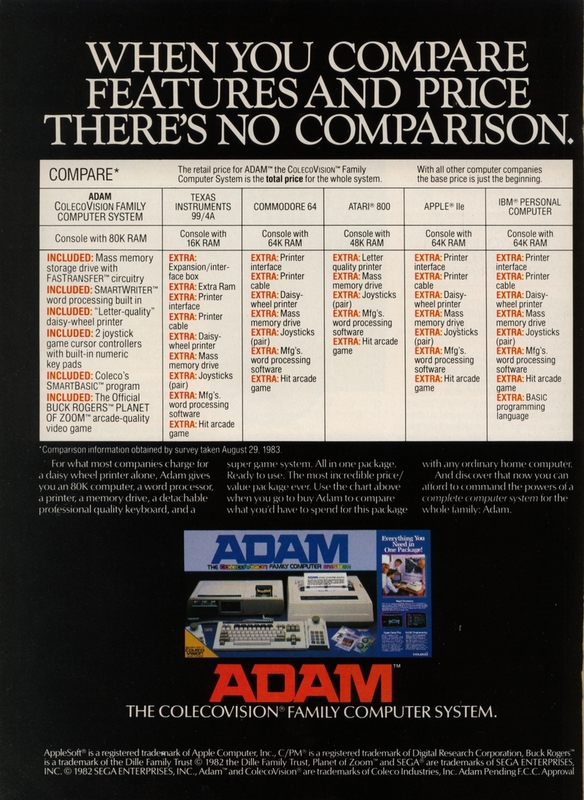 It’s unfortunate for Coleco because the Adam was a pretty good idea and, if they’d been able to execute, it could have really changed the landscape of the ’80s. Unfortunately it was what it was and no amount of advertising was able to save the Adam. Or Coleco. And also, as a followup to my ‘when has this ever been a good thing’ question – playing Zelda Four Swords on the Gamecube with four linked Game Boy Advances was one of the best gaming experiences of my life. That’s all. Here’s Four Swords. Maybe I’ll post on it sometime.